During the Hellenistic classic period, Yehud was absorbed into the subsequent Hellenistic kingdoms that followed the conquests of Alexander the Great, but in the 2nd century BCE the Judaeans revolted against the Seleucid Empire and created the Hasmonean kingdom. This, the last nominally independent kingdom of Israel, gradually lost its independence from 63 BCE with its conquest by Pompey of Rome, becoming a Roman and later Parthian client kingdom. 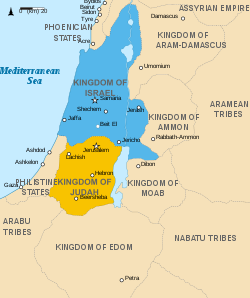 Following the installation of client kingdoms under the Herodian dynasty, the Province of Judea was wracked by civil disturbances, which culminated in the First Jewish–Roman War, the destruction of the Second Temple, the emergence of Rabbinic Judaism and Early Christianity. The name Judea (Iudaea) ceased to be used by Greco-Romans after the revolt of Simon Bar Kochba in 135 CE. The eastern Mediterranean seaboard – the Levant – stretches 400 miles north to south from the Taurus Mountains to the Sinai Peninsula, and 70 to 100 miles east to west between the sea and the Arabian Desert. The coastal plain of the southern Levant, broad in the south and narrowing to the north, is backed in its southernmost portion by a zone of foothills, the Shfela; like the plain this narrows as it goes northwards, ending in the promontory of Mount Carmel. East of the plain and the Shfela is a mountainous ridge, the "hill country of Judah" in the south, the "hill country of Ephraim" north of that, then Galilee and Mount Lebanon. To the east again lie the steep-sided valley occupied by the Jordan River, the Dead Sea, and the wadi of the Arabah, which continues down to the eastern arm of the Red Sea. Beyond the plateau is the Syrian desert, separating the Levant from Mesopotamia. To the southwest is Egypt, to the northeast Mesopotamia. The location and geographical characteristics of the narrow Levant made the area a battleground among the powerful entities that surrounded it. Canaan in the Late Bronze Age was a shadow of what it had been centuries earlier: many cities were abandoned, others shrank in size, and the total settled population was probably not much more than a hundred thousand. Settlement was concentrated in cities along the coastal plain and along major communication routes; the central and northern hill country which would later become the biblical kingdom of Israel was only sparsely inhabited although letters from the Egyptian archives indicate that Jerusalem was already a Canaanite city-state recognising Egyptian overlordship. Politically and culturally it was dominated by Egypt, each city under its own ruler, constantly at odds with its neighbours, and appealing to the Egyptians to adjudicate their differences. The Canaanite city state system broke down during the Late Bronze Age collapse, and Canaanite culture was then gradually absorbed into that of the Philistines, Phoenicians and Israelites. The process was gradual and a strong Egyptian presence continued into the 12th century BCE, and, while some Canaanite cities were destroyed, others continued to exist in Iron Age I. Most scholars today—regardless of whether they accept the biblical Exodus and Conquest traditions as historical—suggest that the ethnogenesis of the tribes of Israel occurred no earlier than the end of the Late Bronze Age or the beginning of the Iron Age. A number of scholars, however, have questioned this view by arguing that “Israel” could have existed in Canaan well before. Sir Alan Gardiner, Hermann Schögl, Donald Redford, and (most recently) Israel Finkelstein have suggested that the biblical tradition likely contains vague memories of the expulsion of the (West Semitic) Hyksos from Egypt at the start of the Eighteenth Dynasty. Jewish historian Flavius Josephus equated the biblical Exodus with the expulsion of the Hyksos from Egypt. Some scholars wish to go beyond the stage of vague memories at this point and argue in favor of a complex sociopolitical situation at the end of the Hyksos period that could have included ethnic and social groups such as the Proto-Israelites, who migrated from Egypt and brought many of the well-fortified Canaanite Bronze Age cities to their knees. Yohanan Aharoni and Aaron Burke have argued that the political and military situation at the end of the Middle Bronze Age was reminiscent of the descriptions of Canaan found in the biblical stories, as they portray a country that was strongly fortified by impressive urban defenses. 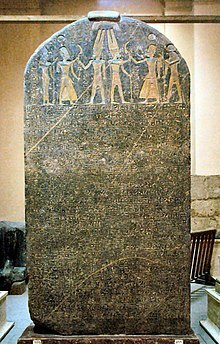 The name "Israel" first appears in the Merneptah Stele c. 1209 BCE: "Israel is laid waste and his seed is no more." 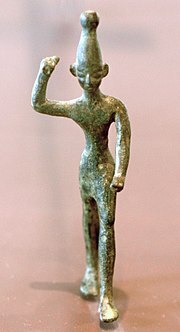 This "Israel" was a cultural and probably political entity, well enough established for the Egyptians to perceive it as a possible challenge, but an ethnic group rather than an organised state; Archaeologist Paula McNutt says: "It is probably ... during Iron Age I [that] a population began to identify itself as 'Israelite'," differentiating itself from its neighbours via prohibitions on intermarriage, an emphasis on family history and genealogy, and religion. In the Late Bronze Age there were no more than about 25 villages in the highlands, but this increased to over 300 by the end of Iron Age I, while the settled population doubled from 20,000 to 40,000. The villages were more numerous and larger in the north, and probably shared the highlands with pastoral nomads, who left no remains. Archaeologists and historians attempting to trace the origins of these villagers have found it impossible to identify any distinctive features that could define them as specifically Israelite – collared-rim jars and four-room houses have been identified outside the highlands and thus cannot be used to distinguish Israelite sites, and while the pottery of the highland villages is far more limited than that of lowland Canaanite sites, it develops typologically out of Canaanite pottery that came before. Israel Finkelstein proposed that the oval or circular layout that distinguishes some of the earliest highland sites, and the notable absence of pig bones from hill sites, could be taken as markers of ethnicity, but others have cautioned that these can be a "common-sense" adaptation to highland life and not necessarily revelatory of origins. Other Aramaean sites also demonstrate a contemporary absence of pig remains at that time, unlike earlier Canaanite and later Philistine excavations. In The Bible Unearthed (2001), Finkelstein and Silberman summarised recent studies. They described how, up until 1967, the Israelite heartland in the highlands of western Palestine was virtually an archaeological terra incognita. Since then, intensive surveys have examined the traditional territories of the tribes of Judah, Benjamin, Ephraim, and Manasseh. These surveys have revealed the sudden emergence of a new culture contrasting with the Philistine and Canaanite societies existing in the Land of Israel earlier during Iron Age I. This new culture is characterised by a lack of pork remains (whereas pork formed 20% of the Philistine diet in places), by an abandonment of the Philistine/Canaanite custom of having highly decorated pottery, and by the practice of circumcision. The Israelite ethnic identity had originated, not from the Exodus and a subsequent conquest, but from a transformation of the existing Canaanite-Philistine cultures. These surveys revolutionized the study of early Israel. The discovery of the remains of a dense network of highland villages – all apparently established within the span of few generations – indicated that a dramatic social transformation had taken place in the central hill country of Canaan around 1200 BCE. There was no sign of violent invasion or even the infiltration of a clearly defined ethnic group. Instead, it seemed to be a revolution in lifestyle. In the formerly sparsely populated highlands from the Judean hills in the south to the hills of Samaria in the north, far from the Canaanite cities that were in the process of collapse and disintegration, about two-hundred fifty hilltop communities suddenly sprang up. Here were the first Israelites. Modern scholars therefore see Israel arising peacefully and internally from existing people in the highlands of Canaan. Unusually favourable climatic conditions in the first two centuries of Iron Age II brought about an expansion of population, settlements and trade throughout the region. In the central highlands this resulted in unification in a kingdom with the city of Samaria as its capital, possibly by the second half of the 10th century BCE when an inscription of the Egyptian pharaoh Shoshenq I, the biblical Shishak, records a series of campaigns directed at the area. Israel had clearly emerged by the middle of the 9th century BCE, when the Assyrian king Shalmaneser III names "Ahab the Israelite" among his enemies at the battle of Qarqar (853). At this time Israel was apparently engaged in a three-way contest with Damascus and Tyre for control of the Jezreel Valley and Galilee in the north, and with Moab, Ammon and Aram Damascus in the east for control of Gilead; the Mesha Stele (c. 830), left by a king of Moab, celebrates his success in throwing off the oppression of the "House of Omri" (i.e., Israel). It bears what is generally thought to be the earliest extra-biblical reference to the name Yahweh. A century later Israel came into increasing conflict with the expanding Neo-Assyrian Empire, which first split its territory into several smaller units and then destroyed its capital, Samaria (722). Both the biblical and Assyrian sources speak of a massive deportation of people from Israel and their replacement with settlers from other parts of the empire – such population exchanges were an established part of Assyrian imperial policy, a means of breaking the old power structure – and the former Israel never again became an independent political entity. King Ahaz's seal is a piece of reddish-brown clay that belonged to King Ahaz of Judah, who ruled from 732 to 716 BCE. This seal contains not only the name of the king, but the name of his father, King Yehotam. In addition, Ahaz is specifically identified as "king of Judah." The Hebrew inscription, which is set on three lines, reads as follows: "l'hz*y/hwtm*mlk*/yhdh", which translates as "belonging to Ahaz (son of) Yehotam, King of Judah." In the 7th century Jerusalem grew to contain a population many times greater than earlier and achieved clear dominance over its neighbours. This occurred at the same time that Israel was being destroyed by the Neo-Assyrian Empire, and was probably the result of a cooperative arrangement with the Assyrians to establish Judah as an Assyrian vassal state controlling the valuable olive industry. Judah prospered as a vassal state (despite a disastrous rebellion against Sennacherib), but in the last half of the 7th century BCE, Assyria suddenly collapsed, and the ensuing competition between Egypt and the Neo-Babylonian Empire for control of the land led to the destruction of Judah in a series of campaigns between 597 and 582. Babylonian Judah suffered a steep decline in both economy and population and lost the Negev, the Shephelah, and part of the Judean hill country, including Hebron, to encroachments from Edom and other neighbours. Jerusalem, while probably not totally abandoned, was much smaller than previously, and the town of Mizpah in Benjamin in the relatively unscathed northern section of the kingdom became the capital of the new Babylonian province of Yehud Medinata. (This was standard Babylonian practice: when the Philistine city of Ashkalon was conquered in 604, the political, religious and economic elite [but not the bulk of the population] was banished and the administrative centre shifted to a new location). There is also a strong probability that for most or all of the period the temple at Bethel in Benjamin replaced that at Jerusalem, boosting the prestige of Bethel's priests (the Aaronites) against those of Jerusalem (the Zadokites), now in exile in Babylon. The Babylonian conquest entailed not just the destruction of Jerusalem and its temple, but the liquidation of the entire infrastructure which had sustained Judah for centuries. The most significant casualty was the state ideology of "Zion theology," the idea that the god of Israel had chosen Jerusalem for his dwelling-place and that the Davidic dynasty would reign there forever. The fall of the city and the end of Davidic kingship forced the leaders of the exile community – kings, priests, scribes and prophets – to reformulate the concepts of community, faith and politics. The exile community in Babylon thus became the source of significant portions of the Hebrew Bible: Isaiah 40–55; Ezekiel; the final version of Jeremiah; the work of the hypothesized priestly source in the Pentateuch; and the final form of the history of Israel from Deuteronomy to 2 Kings. Theologically, the Babylonian exiles were responsible for the doctrines of individual responsibility and universalism (the concept that one god controls the entire world) and for the increased emphasis on purity and holiness. Most significantly, the trauma of the exile experience led to the development of a strong sense of Hebrew identity distinct from other peoples, with increased emphasis on symbols such as circumcision and Sabbath-observance to sustain that distinction. The concentration of the biblical literature on the experience of the exiles in Babylon disguises the fact that the great majority of the population remained in Judah; for them, life after the fall of Jerusalem probably went on much as it had before. It may even have improved, as they were rewarded with the land and property of the deportees, much to the anger of the community of exiles remaining in Babylon. The assassination around 582 of the Babylonian governor by a disaffected member of the former royal House of David provoked a Babylonian crackdown, possibly reflected in the Book of Lamentations, but the situation seems to have soon stabilised again. Nevertheless, those unwalled cities and towns that remained were subject to slave raids by the Phoenicians and intervention in their internal affairs by Samaritans, Arabs, and Ammonites. When Babylon fell to the Persian Cyrus the Great in 539 BCE, Judah (or Yehud medinata, the "province of Yehud") became an administrative division within the Persian empire. Cyrus was succeeded as king by Cambyses, who added Egypt to the empire, incidentally transforming Yehud and the Philistine plain into an important frontier zone. His death in 522 was followed by a period of turmoil until Darius the Great seized the throne in about 521. Darius introduced a reform of the administrative arrangements of the empire including the collection, codification and administration of local law codes, and it is reasonable to suppose that this policy lay behind the redaction of the Jewish Torah. After 404 the Persians lost control of Egypt, which became Persia's main rival outside Europe, causing the Persian authorities to tighten their administrative control over Yehud and the rest of the Levant. Egypt was eventually reconquered, but soon afterward Persia fell to Alexander the Great, ushering in the Hellenistic period in the Levant. Yehud's population over the entire period was probably never more than about 30,000 and that of Jerusalem no more than about 1,500, most of them connected in some way to the Temple. According to the biblical history, one of the first acts of Cyrus, the Persian conqueror of Babylon, was to commission Jewish exiles to return to Jerusalem and rebuild their Temple, a task which they are said to have completed c. 515. Yet it was probably not until the middle of the next century, at the earliest, that Jerusalem again became the capital of Judah. The Persians may have experimented initially with ruling Yehud as a Davidic client-kingdom under descendants of Jehoiachin, but by the mid–5th century BCE, Yehud had become, in practice, a theocracy, ruled by hereditary high priests, with a Persian-appointed governor, frequently Jewish, charged with keeping order and seeing that taxes (tribute) were collected and paid. According to the biblical history, Ezra and Nehemiah arrived in Jerusalem in the middle of the 5th century BCE, the former empowered by the Persian king to enforce the Torah, the latter holding the status of governor with a royal commission to restore Jerusalem's walls. The biblical history mentions tension between the returnees and those who had remained in Yehud, the returnees rebuffing the attempt of the "peoples of the land" to participate in the rebuilding of the Temple; this attitude was based partly on the exclusivism that the exiles had developed while in Babylon and, probably, also partly on disputes over property. During the 5th century BCE, Ezra and Nehemiah attempted to re-integrate these rival factions into a united and ritually pure society, inspired by the prophecies of Ezekiel and his followers. The Persian era, and especially the period between 538 and 400 BCE, laid the foundations for the unified Judaic religion and the beginning of a scriptural canon. Other important landmarks in this period include the replacement of Hebrew as the everyday language of Judah by Aramaic (although Hebrew continued to be used for religious and literary purposes) and Darius's reform of the empire's bureaucracy, which may have led to extensive revisions and reorganizations of the Jewish Torah. The Israel of the Persian period consisted of descendants of the inhabitants of the old kingdom of Judah, returnees from the Babylonian exile community, Mesopotamians who had joined them or had been exiled themselves to Samaria at a far earlier period, Samaritans, and others. On the death of Alexander the Great (322 BCE), Alexander's generals divided the empire among themselves. Ptolemy I, the ruler of Egypt, seized Yehud Medinata, but his successors lost it in 198 to the Seleucids of Syria. At first, relations between Seleucids and Jews were cordial, but the attempt of Antiochus IV Epiphanes (174–163) to impose Hellenic cults on Judea sparked a national rebellion that ended in the expulsion of the Seleucids and the establishment of an independent Jewish kingdom under the Hasmonean dynasty. Some modern commentators see this period also as a civil war between orthodox and hellenized Jews. Hasmonean kings attempted to revive the Judah described in the Bible: a Jewish monarchy ruled from Jerusalem and including all territories once ruled by David and Solomon. In order to carry out this project, the Hasmoneans forcibly converted one-time Moabites, Edomites, and Ammonites to Judaism, as well as the lost kingdom of Israel. Some scholars argue that the Hasmonean dynasty institutionalized the final Jewish biblical canon. In 63 BCE the Roman general Pompey conquered Jerusalem and made the Jewish kingdom a client state of Rome. In 40–39 BCE, Herod the Great was appointed King of the Jews by the Roman Senate, and in 6 CE the last ethnarch of Judea was deposed by the emperor Augustus, his territories combined with Idumea and Samaria and annexed as Iudaea Province under direct Roman administration. The name Judea (Iudaea) ceased to be used by Greco-Romans after the revolt of Simon Bar Kochba in 135 CE; the area was henceforth called Syria Palaestina (Greek: Παλαιστίνη, Palaistinē; Latin: Palaestina). The religion of the Israelites of Iron Age I, like the Ancient Canaanite religion from which it evolved and other religions of the ancient Near East, was based on a cult of ancestors and worship of family gods (the "gods of the fathers"). With the emergence of the monarchy at the beginning of Iron Age II the kings promoted their family god, Yahweh, as the god of the kingdom, but beyond the royal court, religion continued to be both polytheistic and family-centered. The major deities were not numerous – El, Asherah, and Yahweh, with Baal as a fourth god, and perhaps Shamash (the sun) in the early period. At an early stage El and Yahweh became fused and Asherah did not continue as a separate state cult, although she continued to be popular at a community level until Persian times. Yahweh, the national god of both Israel and Judah, seems to have originated in Edom and Midian in southern Canaan and may have been brought to Israel by the Kenites and Midianites at an early stage. There is a general consensus among scholars that the first formative event in the emergence of the distinctive religion described in the Bible was triggered by the destruction of Israel by Assyria in c. 722 BCE. Refugees from the northern kingdom fled to Judah, bringing with them laws and a prophetic tradition of Yahweh. This religion was subsequently adopted by the landowners of Judah, who in 640 BCE placed the eight-year-old Josiah on the throne. Judah at this time was a vassal state of Assyria, but Assyrian power collapsed in the 630s, and around 622 Josiah and his supporters launched a bid for independence expressed as loyalty to "Yahweh alone". According to the Deuteronomists, as scholars call these Judean nationalists, the treaty with Yahweh would enable Israel's god to preserve both the city and the king in return for the people's worship and obedience. The destruction of Jerusalem, its Temple, and the Davidic dynasty by Babylon in 587/586 BCE was deeply traumatic and led to revisions of the national mythos during the Babylonian exile. This revision was expressed in the Deuteronomistic history, the books of Joshua. Judges, Samuel and Kings, which interpreted the Babylonian destruction as divinely-ordained punishment for the failure of Israel's kings to worship Yahweh to the exclusion of all other deities. The Second Temple period (520 BCE – 70 CE) differed in significant ways from what had gone before. Strict monotheism emerged among the priests of the Temple establishment during the seventh and sixth centuries BCE, as did beliefs regarding angels and demons. At this time, circumcision, dietary laws, and Sabbath-observance gained more significance as symbols of Jewish identity, and the institution of the synagogue became increasingly important, and most of the biblical literature, including the Torah, was written or substantially revised during this time. ^ King & Stager 2001, p. xxiii. ^ Miller 1986, p. 36. ^ Coogan 1998, pp. 4–7. ^ Finkelstein 2001, p. 78. ^ a b Killebrew 2005, pp. 38–39. ^ Cahill in Vaughn 1992, pp. 27–33. ^ Kuhrt 1995, p. 317. ^ Killebrew 2005, pp. 10–6. ^ Golden 2004b, pp. 61–62. ^ Golden 2004a, p. 155. ^ McNutt 1999, pp. 46–47. ^ Edelman in Brett 2002, pp. 46–47. ^ Avraham Faust, “How Did Israel Become a People? The Genesis of Israelite Identity”, Biblical Archaeology Review 201 (2009): 62–69, 92–94. ^ Finkelstein and Silberman (2001), p. 107. ^ Compare: Gnuse, Robert Karl (1997). No Other Gods: Emergent Monotheism in Israel. Journal for the study of the Old Testament: Supplement series. 241. Sheffield: A&C Black. p. 31. ISBN 9781850756576. Retrieved 2016-06-02. Out of the discussions a new model is beginning to emerge, which has been inspired, above all, by recent archaeological field research. There are several variations in this new theory, but they share in common the image of an Israelite community which arose peacefully and internally in the highlands of Palestine. ^ a b c Thompson 1992, p. 408. ^ Mazar in Finkelstein 2007, p. 163. ^ Patrick D. Miller (2000). The Religion of Ancient Israel. Westminster John Knox Press. pp. 40–. ISBN 978-0-664-22145-4. ^ Lemche 1998, p. 85. ^ Grabbe 2008, pp. 225–26. ^ Lehman in Vaughn 1992, p. 149. ^ David M. Carr, Writing on the Tablet of the Heart: Origins of Scripture and Literature, Oxford University Press, 2005, 164. ^ First Impression: What We Learn from King Ahaz’s Seal (#m1), by Robert Deutsch, Archaeological Center. ^ a b c Thompson 1992, pp. 410–11. ^ Grabbe 2004, p. 28. ^ Lemaire in Blenkinsopp 2003, p. 291. ^ Lipschits 2005, p. 48. ^ Blenkinsopp in Blenkinsopp 2003, pp. 103–05. ^ Blenkinsopp 2009, p. 228. ^ Middlemas 2005, pp. 1–2. ^ Miller 1986, p. 203. ^ Middlemas 2005, p. 2. ^ a b Middlemas 2005, p. 10. ^ Middlemas 2005, p. 17. ^ Bedford 2001, p. 48. ^ Barstad 2008, p. 109. ^ Albertz 2003a, p. 92. ^ Albertz 2003a, pp. 95–96. ^ Albertz 2003a, p. 96. ^ a b Blenkinsopp 1988, p. 64. ^ Lipschits in Lipschits 2006, pp. 86–89. ^ Grabbe 2004, pp. 29–30. ^ Nodet 1999, p. 25. ^ Davies in Amit 2006, p. 141. ^ Niehr in Becking 1999, p. 231. ^ Wylen 1996, p. 25. ^ Grabbe 2004, pp. 154–55. ^ Soggin 1998, p. 311. ^ Miller 1986, p. 458. ^ Blenkinsopp 2009, p. 229. ^ Albertz 1994, pp. 437–38. ^ Kottsieper in Lipschits 2006, pp. 109–10. ^ Becking in Albertz 2003b, p. 19. ^ Weigel, David. "Hanukkah as Jewish civil war". Slate.com. Slate Magazine. Retrieved 2012-08-15. ^ "The Revolt of the Maccabees". Simpletoremember.com. Retrieved 2012-08-15. ^ Davies 1992, pp. 149–50. ^ Philip R. Davies in The Canon Debate, p. 50: "With many other scholars, I conclude that the fixing of a canonical list was almost certainly the achievement of the Hasmonean dynasty." ^ Ben-Sasson 1976, p. 246. ^ Van der Toorn 1996, p. 4. ^ Van der Toorn 1996, pp. 181–82. ^ a b Smith 2002, p. 57. ^ Van der Toorn 1999, p. 911–13. ^ Grabbe (2004), pp. 243–44. Albertz, Rainer (1994) [Vanderhoek & Ruprecht 1992]. A History of Israelite Religion, Volume I: From the Beginnings to the End of the Monarchy. Westminster John Knox Press. Albertz, Rainer (1994) [Vanderhoek & Ruprecht 1992]. A History of Israelite Religion, Volume II: From the Exile to the Maccabees. Westminster John Knox Press. Albertz, Rainer (2003a). Israel in Exile: The History and Literature of the Sixth Century B.C.E. Society of Biblical Literature. Barstad, Hans M. (2008). History and the Hebrew Bible. Mohr Siebeck. Becking, Bob; Korpel, Marjo Christina Annette, eds. (1999). The Crisis of Israelite Religion: Transformation of Religious Tradition in Exilic and Post-Exilic Times. Brill. CS1 maint: Extra text: authors list (link) Niehr, Herbert. Religio-Historical Aspects of the Early Post-Exilic Period. Bedford, Peter Ross (2001). Temple Restoration in Early Achaemenid Judah. Brill. Blenkinsopp, Joseph; Lipschits, Oded, eds. (2003). Judah and the Judeans in the Neo-Babylonian Period. Eisenbrauns. CS1 maint: Extra text: authors list (link) Blenkinsopp, Joseph. "Bethel in the Neo-Babylonian Period". Missing or empty |title= (help) Lemaire, André. Nabonidus in Arabia and Judea During the Neo-Babylonian Period. Bloch-Smith, Elizabeth (2008). "Bible, Archaeology, and the Social Sciences". In Frederick E. Greenspahn. The Hebrew Bible: new insights and scholarship. NYU Press. Bright, John (2000) . A History of Israel (4th ed.). Westminster John Knox Press. Davies, Philip R. (1992). In Search of Ancient Israel. Sheffield. Davies, Philip R. (2009). "The Origin of Biblical Israel". Journal of Hebrew Scriptures. 9 (47). Archived from the original on 28 May 2008. Day, John (2002). Yahweh and the Gods and Goddesses of Canaan. Sheffield Academic Press. Dever, William (2001). What Did the Biblical Writers Know, and When Did They Know It?. Eerdmans. Dever, William (2005). Did God Have a Wife? : Archaeology and Folk Religion in Ancient Israel. Eerdmans. Finkelstein, Israel; Silberman, Neil Asher (2001). The Bible Unearthed. Gnuse, Robert Karl (1997). No Other Gods: Emergent Monotheism in Israel. Sheffield Academic Press. Golden, Jonathan Michael (2004a). Ancient Canaan and Israel: An Introduction. Oxford University Press. Golden, Jonathan Michael (2004b). Ancient Canaan and Israel: New Perspectives. ABC-CLIO. Goodison, Lucy; Morris, Christine (1998). Goddesses in Early Israelite Religion in Ancient Goddesses: The Myths and the Evidence. University of Wisconsin Press. Grabbe, Lester L. (2004). A History of the Jews and Judaism in the Second Temple Period. T&T Clark International. Kuhrt, Amélie (1995). The Ancient Near East c. 3000–330 BCE. Routledge. Markoe, Glenn (2000). Phoenicians. University of California Press. Nodet, Étienne (1999) [Editions du Cerf 1997]. A Search for the Origins of Judaism: From Joshua to the Mishnah. Sheffield Academic Press. Pitkänen, Pekka (2004). "Ethnicity, Assimilation and the Israelite Settlement" (PDF). Tyndale Bulletin. 55 (2): 161–82. Archived from the original (PDF) on 17 July 2011. Smith, Mark S.; Miller, Patrick D. (2002) [Harper & Row 1990]. The Early History of God. Eerdmans. Rendsburg, Gary (2008). "Israel without the Bible". In Frederick E. Greenspahn. The Hebrew Bible: new insights and scholarship. NYU Press. Soggin, Michael J. (1998). An Introduction to the History of Israel and Judah. Paideia. Thompson, Thomas L. (1992). Early History of the Israelite People. Brill. Van der Toorn, Karel (1996). Family Religion in Babylonia, Syria, and Israel. Brill. Van der Toorn, Karel; Becking, Bob; Van der Horst, Pieter Willem (1999). Dictionary of Deities and Demons in the Bible (2d ed.). Koninklijke Brill. Wylen, Stephen M. (1996). The Jews in the Time of Jesus: An Introduction. Paulist Press. Zevit, Ziony (2001). The Religions of Ancient Israel: A Synthesis of Parallactic Approaches. Continuum.